Lynda Weinman, Evergreen alumna (1976) and co-founder and executive chair of the board of lynda.com, just acquired by LinkedIn for $1.5 billion. The LA Times and Money reported today that lynda.com, the online learning company created by Lynda Weinman ’76 and her husband, Bruce Heavin, has been sold to LinkedIn for $1.5 billion. Lynda epitomizes the power of interdisciplinary education. After graduating from Evergreen, Weinman opened two retail shops in California and later became an animator for the movie business. This move led to an early fascination with personal computers, which she embraced for her animation work, and, from there, she began teaching computer graphics and writing how-to books. 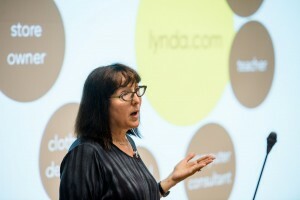 Finally she started the online learning business lynda.com. Evergreen’s emphasis on adaptability, problem solving and entrepreneurial thinking has led many alumni to stunning success in a wide range of fields. Lynda Weinman is a great example. Evergreen congratulates Lynda on her success. We are grateful for Lynda and Bruce’s support over these many years and wish them well as their next adventure unfolds.